Here you can find a strain description about AK Automatic (SpliffSeeds) and also some user-based reviews and infos directly from the SeedFinder (if available). 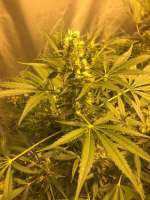 You can also find the offers and auctions here if AK Automatic (SpliffSeeds) cannabis seeds are on stock at MyCannapot right now. AK of Colombian, Thai, Mexican, Afghani heritage meets Dutch Automatic (Ruderalis, Northern Light, Santa Maria, Blueberry and Afghani genetics). She is very easy to grow (idiot proof) and doesnt require a lot of nutrients. With no growing period AK Automatic will form one principal cola and a few smaller side branches. She is a short and bushy, typical trait of an Indica dominant strain. First signs of flowering will appear around the fourth week. To achieve full potential of the plant please stick to a 20/4 light schedule. Initiation of flowering onto around 15 cm. - Final Height onto around 68 cm. TheGrowsausage I started 5 of these and grew them in 12l pots. Something went wrong in the early stages of the grow and they started to flower at the end of week 2, and I was thinking it was all going to go bad. I used bio bizz all mix, bio bizz nutes, and gave molasses once a week during flower. I pulled a few of the upper fan leaves off at the start to get more light down in the plants, but no serious pruning. They all ended up between about 25 and 45 cms in height. The yield was very impressive for such short plant, I ended up with 260grams and that is after losing around 30grams to bud rot. I will definitely be growing AK autos again to see what I can get when I dont screw up. AutoAlan growz very tall & many side branches . my neighbour said this plant was very smelly, so iz good for outside but careful! GreenMachine3000 First time growing autoflowers and I'm impressed. I grew five of these on my balcony in 20L pots with a mix of perlite and regular potting soil. They were between 80 and 120cm tall, yielded between 30 and 60 grams each and were done about 11 weeks after I planted them. Didn't prune at all, but in retrospect I would have stripped off some of the smallest buds and branches as these didn't do much for my yield and were a lot of work to trim. Quite leafy for a supposed 50/50 hybrid, im thinking there might be some more sativa in here than the 40% they state on the pack. Good smoke for an outdoor grow, not super strong but a nice balanced high that leans towards a sativa high with a sour and floral flavour/smell. All in all a nice fast, short and productive strain. AK Automatic (SpliffSeeds) is not available at our shop at the moment!